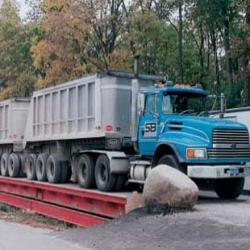 Thurman 8120 Series Mechanical Steel Deck Truck Scales Uniquely designed truck scale model 8120 combines the proven reliable performance of a mechanical lever system with a rigid, welded steel weighbridge structure. These models have been field proven for years in demanding industries such as mining road construction, quarries, logging, steel mills and landfills. Item Number .................... Deck Size ................... Nominal Cap. ..................... Modules ..................... Shipping Wt.